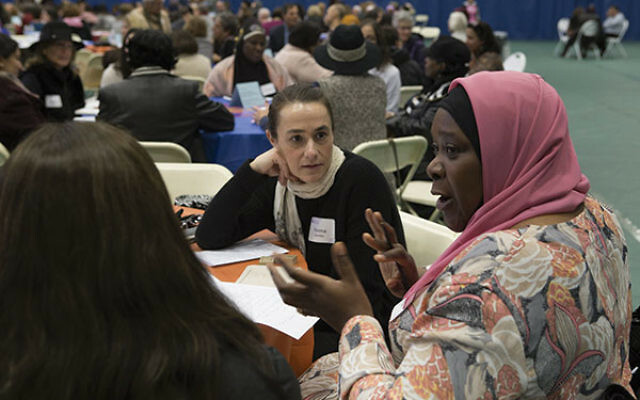 Muslim and Jewish women converse at the Dec. 4 Sisterhood of Salaam Shalom conference at Drew University. The election of Donald Trump as president and the appointment of former Breitbart News chair Stephen Bannon as chief White House strategist have generated a great deal of unease in the Muslim community. As Jews, we have both a moral obligation and an enlightened self-interest to make sure Muslim Americans feel safe and completely at home in America. 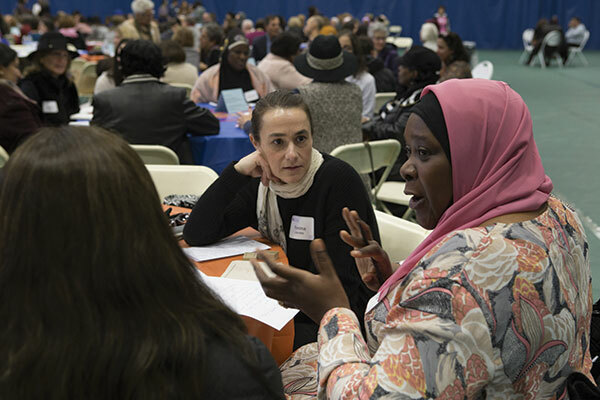 Three years ago, North Brunswick resident Sheryl Olitzky launched the Sisterhood of Salaam Shalom, the only national organization focusing on Muslim and Jewish women with the goal of living in harmony. Of the approximately 50 Sisterhood chapters already running or in the works nationwide, 14 are in New Jersey. Joshua Cohen, NJ director of the Anti-Defamation League, said that his agency has been expanding its outreach to Muslims for years, but it’s particularly important now that the FBI has reported a 67 percent increase in hate crimes against Muslims nationwide in 2015. But Muslims aren’t the only group being targeted; the FBI also found that anti-Jewish hate crimes were up 9 percent and constituted more than 50 percent of all religious-based hate crimes. Cohen preached caution to those who presume a direct correlation to the contentious rhetoric from the presidential campaign, but didn’t dismiss the notion altogether, either. The obligation we have as Jews to be in the forefront of efforts to protect the security and rights of Muslim Americans should be self-evident. Everything in our value system and historical experience of persecution as a religious minority cries out for this engagement. It is also in our interest. A study done by the Pew Research Center showed that in 2015 there were some 3.3 million Muslims in the United States; New Jersey has three times as many Muslim adults per capita as the national average. By 2050, the American-Muslim population is projected to reach 8.1 million people or 2.1 percent of the total population, exceeding the American-Jewish population. Consequently, the Muslim community’s political potency is destined to grow in the years ahead, and we will be well served to nurture it as a coalition partner on a range of domestic and international concerns. There is a broader context here as well. A fierce struggle is raging within the Islamic world between moderate, peace-loving people who embrace a progressive 21st-century interpretation of the Koran and radical anti-Western Islamists who distort the words of the Islamic prophet Mohammed to justify heinous acts of terrorism. A democratic and pluralistic America providing a welcoming home to its Muslim minority would send a powerful message and reinforce the progressive views of the moderates, whereas an America perceived as hostile to Muslims can only strengthen the radicals. It’s no secret that through the centuries the Jewish people have had a less than ideal relationship with much of the Muslim world, although we often fared better as a minority in Muslim societies than in Christian ones. Truth is that the vast majority of Muslims are peaceful people who bear us no ill will or wish us harm, and now we have a common cause that might help alleviate past or current tensions. We must not allow this to become a partisan political issue. The well-being of our Muslim neighbors should be everybody’s business.